A sensitive family portrait wrapped up in secrets and misunderstandings. 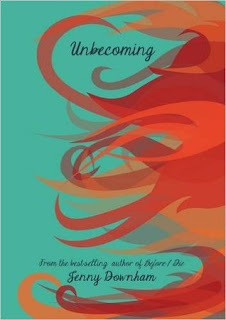 Unbecoming is Jenny Downham's third novel. Set in the town of Bisham, we meet seventeen year old Katie, her mother Caroline, and her younger brother Chris. She's never met her maternal grandmother but Mary has come to live with them after her mother was called as the emergency contact. Mary has dementia but despite this Caroline does not want her to live with them. It's a subject that she chooses not to discuss, but she was abandoned by Mary at a young age and brought up by her aunt. Katie on the other hand finds Mary delightful and the two instantly bond. Katie sets about writing down the stories Mary tells her and keeps them in a book to use as a way to remind Mary of who she is. I assumed because there were three women in this story, that there would be three perspectives, but there are only two, Katie's and Mary's. I think it was a clever way to approach the story as Caroline is not a likeable character on first meeting her, but she's also in the dark about a lot of her early childhood and as she learns about it so does the reader, this bring us closer and allows us to have more empathy towards her. I adored Katie, she's a wonderful girl but she feels trapped by her mother's rules and by her secret - she thinks she's a lesbian and is terrified of her mother finding out. Already she's being teased at school by her former best friend, but having Mary in her life allows her to grow and discover who she doesn't want to be. Mary was lovely and her story was so sad. She's confused about who she is, why she's come to stay with her daughter and grandchildren, but takes pleasure in telling Katie stories of her younger years. Jenny Downham really knows how to write an emotional story, and Unbecoming is no exception, I felt so much for this family and really loved the time spent reading about their lives. The ending was beautiful, full of hope yet tinged with sadness too. This is a YA book that could easily be enjoyed by adults as well, it's a realistic coming of age story combined with historical fiction.